Edited by: Dymitr Ibriszimow, Henry Tourneux, H. Ekkehard Wolff. The term Chadic Languages nowadays mostly describes the more than 140 individual languages and dialects spoken in the geographical area of northern Nigeria, northern Cameroon and the south of the Chad. The Chadic languages belong to the Afro-Asiatic (formerly: Hamito-Semitic) language family. By far the most important language of this group is Hausa, which is spoken by between 40 to 50 million people and is the most important vehicular language used in western and central Africa. The other Chadic languages combined total only about a further half a million speakers. The contributions to this series are double peer-reviewed. Edited by: Henry Tourneux, Yvonne Treis. With contributions by: Umma Aliyu Musa, Sergio Baldi, Gian Claudio Batic, Roger M. Blench, Philippe Cassuto [show more…], Emma Kuipers, Rudolf Leger, Joseph Lovestrand, Joseph A. McIntyre, Esther Morgenthal, Paul Newman, Nina Pawlak, Victor Porkhomovsky, James S. Roberts, Henning Schreiber, Albert Camus Soulokadi, Olga Stolbova, Henry Tourneux, Melanie Viljoen. Edited by: Dymitr Ibriszimow. With contributions by: Umar Ahmed, Sergio Baldi, Václav Blažek, Rudolf Leger, James S. Roberts [show more…], Olga Stolbova, Henry Tourneux, H. Ekkehard Wolff. Edited by: Henry Tourneux. With contributions by: Sergio Baldi, Gian Claudio Batic, Václav Blažek, Roger M. Blench, Bernard Caron [show more…], Jules Jacques Coly, Richard Gravina, Mary Pearce, James S. Roberts, Olga Stolbova, Alessandro Suzzi-Valli, Gábor Takács, Henry Tourneux, H. Ekkehard Wolff, Ulrike Zoch. Edited by: Doris Löhr, Ari Awagana. With contributions by: Ari Awagana, Sergio Baldi, Václav Blažek, Roger M. Blench, Richard Gravina [show more…], Birgit Hellwig, Dymitr Ibriszimow, Rudolf Leger, Marit Lobben, Doris Löhr, Adam Mahamat, Maria Schubert, Gábor Takács, Henry Tourneux, Balarabe Zulyadaini. Edited by: Eva Rothmaler. With contributions by: Sean Allison, Heike Andreas, Ari Awagana, Gian Claudio Batic, Václav Blažek [show more…], Roger M. Blench, Dymitr Ibriszimow, Rudolf Leger, Doris Löhr, Adam Mahamat, Baba Mai Bello, Antony Ndamsai, Joy Naomi Philip, Victor Porkhomovsky, James S. Roberts, Valery Sheshin, Olga Stolbova, Henry Tourneux, H. Ekkehard Wolff, Georg Ziegelmeyer, Ulrike Zoch, Balarabe Zulyadaini. Edited by: Henry Tourneux. With contributions by: Roberto Ajello, Ari Awagana, Roger M. Blench, Raymond Boyd, Doris Löhr [show more…], Joy Naomi Ruff, Henry Tourneux, H. Ekkehard Wolff. Edited by: Henry Tourneux. With contributions by: Sean Allison, Sergio Baldi, Richard Gravina, Olga Stolbova, Gábor Takács. Edited by: Dymitr Ibriszimow. 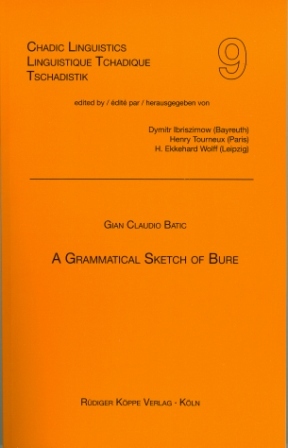 With contributions by: Michael Bross, Véronique de Colombel, Dymitr Ibriszimow, Philip J. Jaggar, Silvia Sanvito [show more…], Olga Stolbova, Gábor Takács, Henry Tourneux, H. Ekkehard Wolff. Edited by: H. Ekkehard Wolff. With contributions by: Ari Awagana, Roger M. Blench, Véronique de Colombel, Amedeo De Dominicis, Dymitr Ibriszimow [show more…], Muhammed M. Munkaila, Victor Porkhomovsky, Henry Tourneux, H. Ekkehard Wolff.